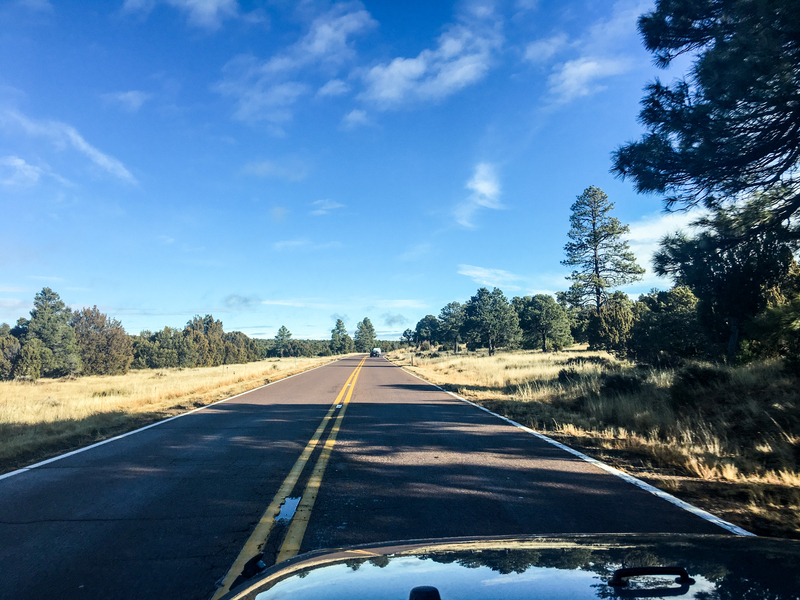 The drive from Monarch to Frisco and Copper Mountain was the most intense 104-mile drive of my life. It took three hours. During the trip I probably saw about five total miles of bare pavement, the rest was all ice-encrusted. I’ve been living in Oklahoma for the last three years; this was not an environment for which I’ve had a lot of recent experience. My goal for most of the drive was that, when they got close enough to see my plates, the Coloradans would back off a little and say to themselves, well, for an Oklahoman, he’s actually doing okay. 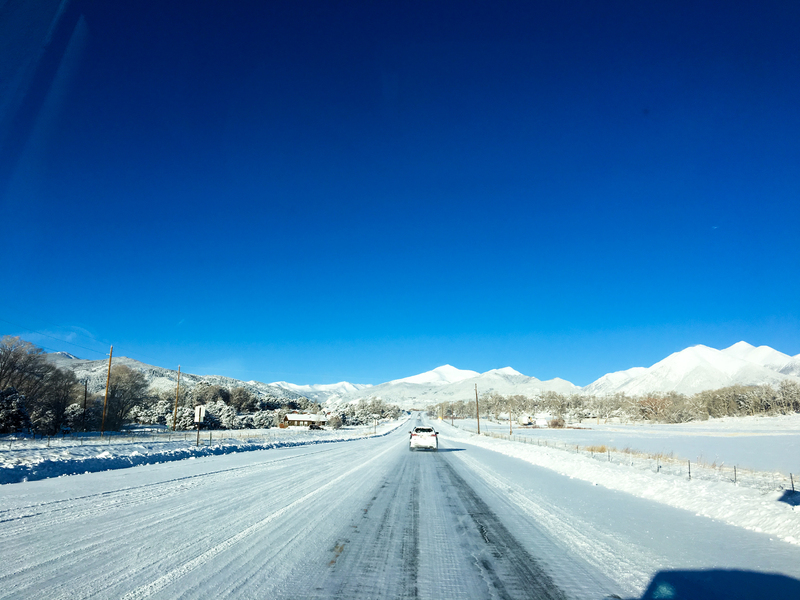 Okay, so this was actually the road to Monarch from Salida a couple days earlier. But the coverage in the oncoming lane was about what it was from Salida all the way to Frisco. The actual highway isn’t pictured because I had way too tight a grip on the wheel, and I was a little too focused to be breaking the camera out. Also, traffic was really bad through Buena Vista (a town in Colorado). 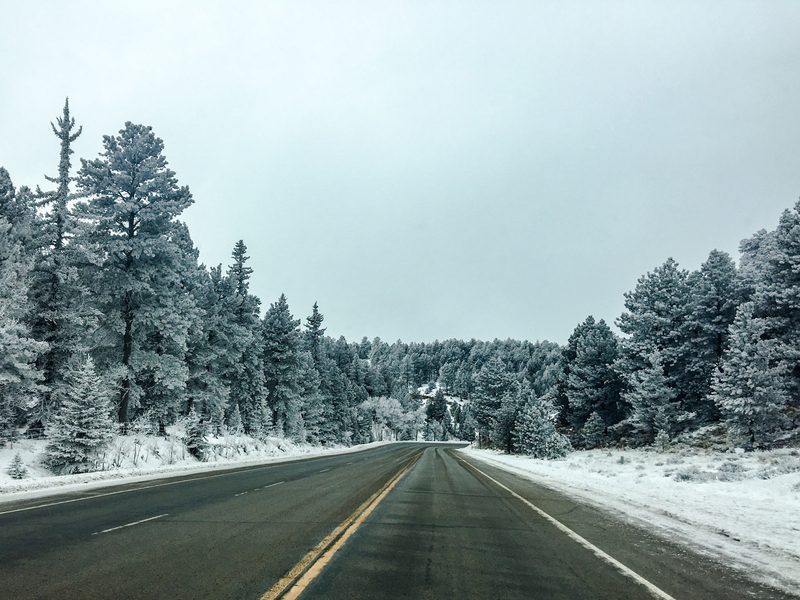 One of the ancillary problems with being sketched out by the road conditions is that the drive itself was (probably) really pretty. I took little notice. 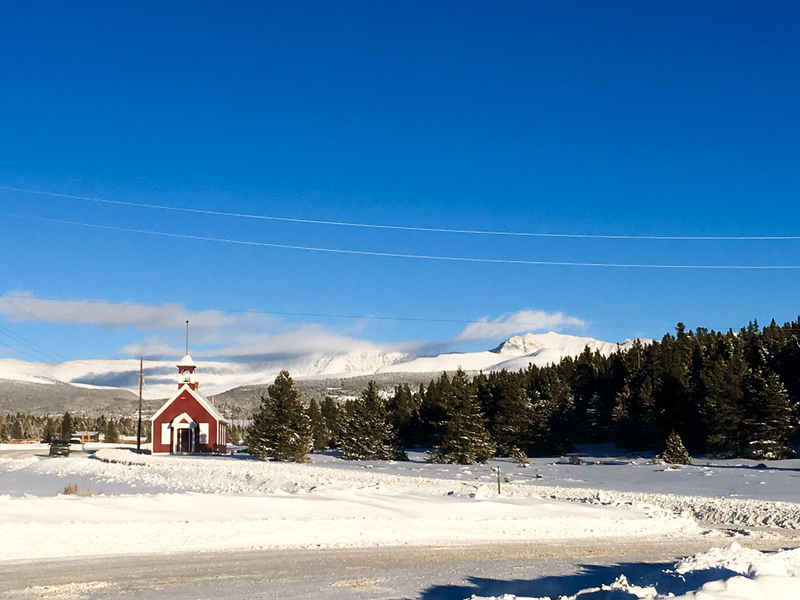 And then I got to Leadville, elevation 10,151′. Cool mining town that was featured in one of my favorite non-fiction books, Making of a Hardrock Miner. But also: 10,151′! 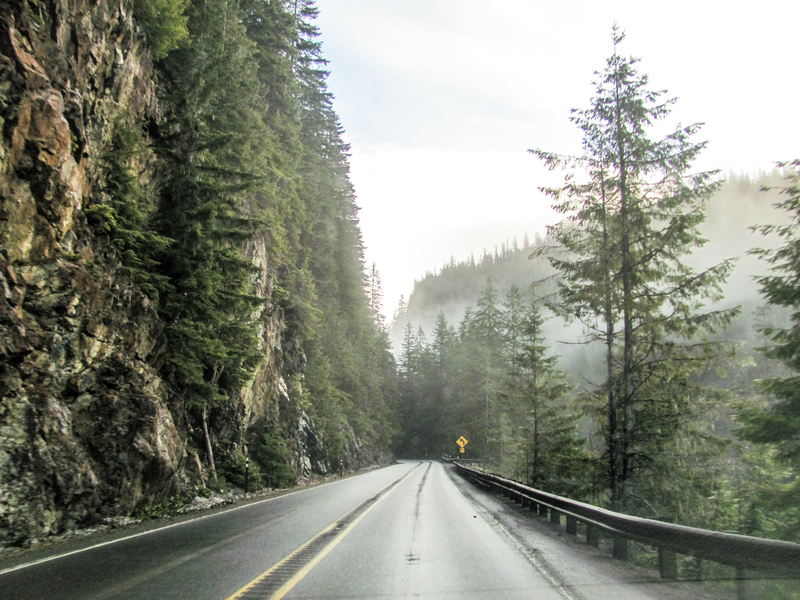 Leaving town, then, there’s a sign that says that the actual high point of the pass is still several miles ahead. 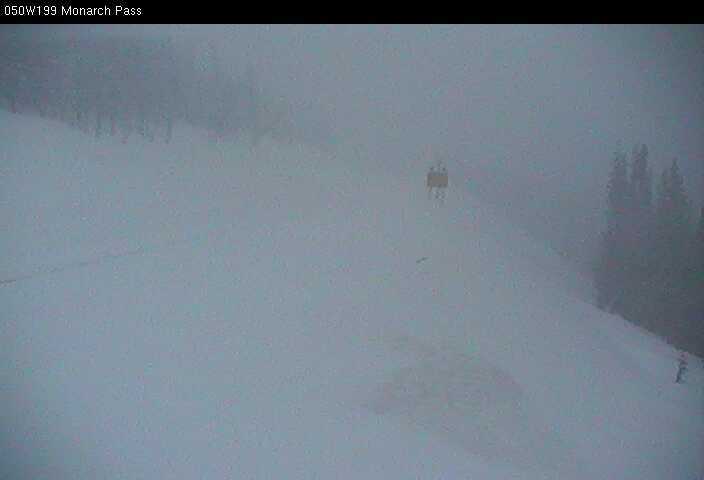 That was Fremont Pass, elevation 11,318′. Holy carp, Colorado. 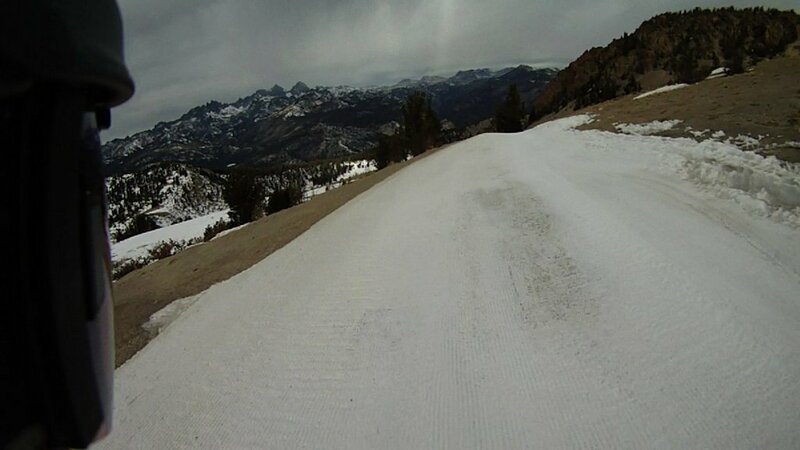 This was early January, snow covered, storm on the way in, and you got your 11,000-foot passes wide open. Equal parts intimidating and impressive. Also, and just to be clear, the road conditions weren’t a problem for my Jeep. Nervousness was 100% on me. No, I’m not just being an enabler for my car. Then I was in Frisco. My brother Garry got there that same night, having driven down from South Dakota. He was there for five days and I was there for seven. 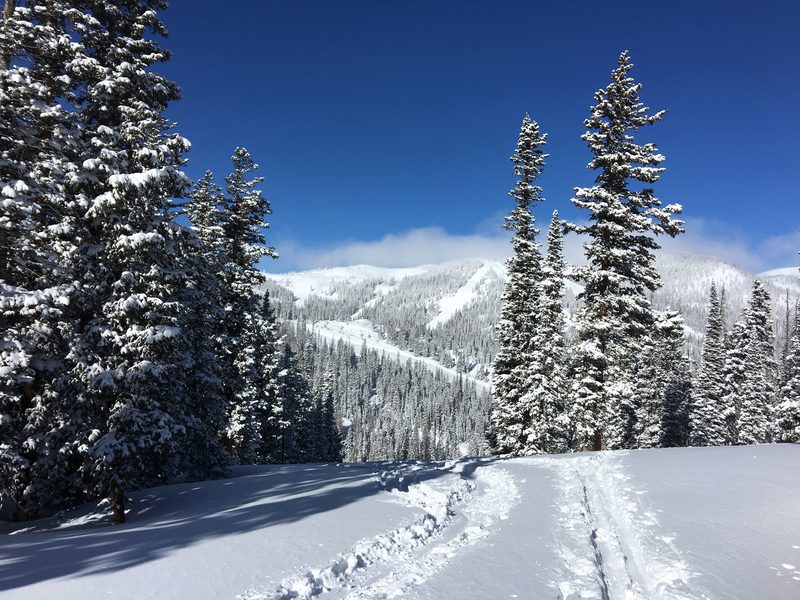 I got five days in at Copper out of those seven, which is pretty good for me. Snow was decent on Saturday, then pretty close to excellent for all the other days. Copper does a great job of spreading people out even on high-traffic days. This was on, I think, the Monday. Garry has since forsaken the yellow jacket. RIP. 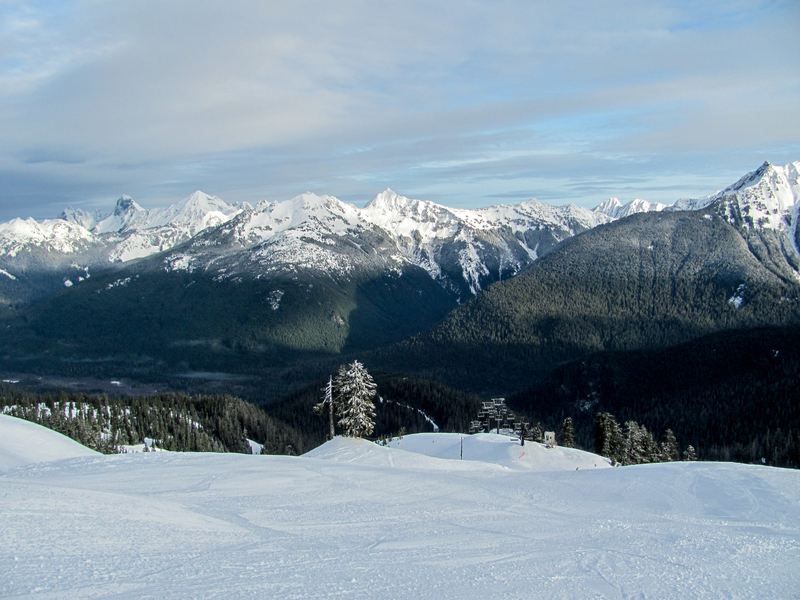 Here’s a panorama shot I thought was decent from the top of the mountain. 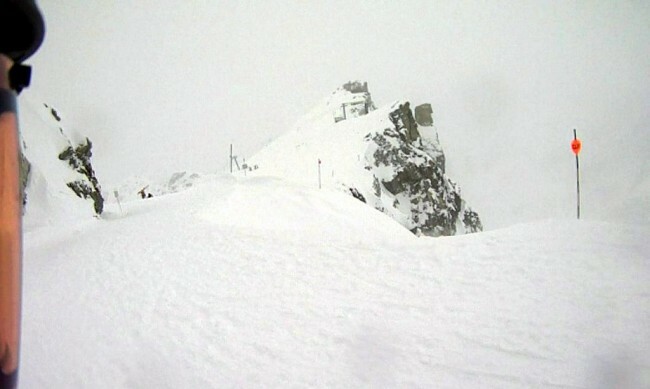 It’s the Rendezvous lift at left and the top of Blackjack at right. I mean, once it was mostly eaten. It cost us about 15 minutes. The skiing was pretty amazing after that. 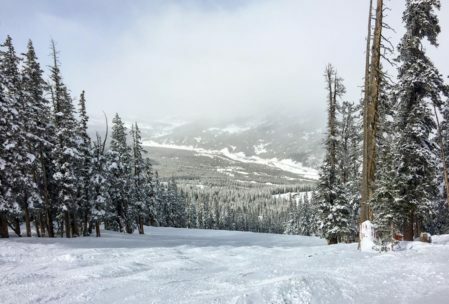 One of the great oddities of Copper Mountain is that, while most of its visitors are families and intermediate skiers, they also have a lot of interesting terrain available. 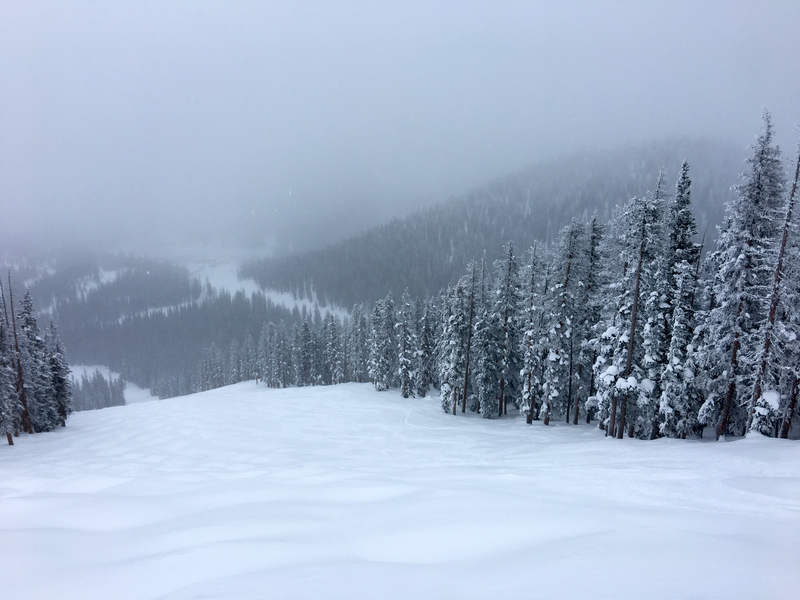 So, even though it was a powder day and there were plenty of people on the mountain’s front-side, Copper has this backside that seems utterly forgotten and where, therefore, there’s still plenty of good snow long after it’s been skied off on the front side. The two chairs back there are slow two-seaters, but whatever: it’s kind of nice to have a long ride between runs to help you catch your breath. At lunch on the Thursday of that week, given similar snow conditions, I composed the following. Staying in Frisco was a good bet once the condo’s owner got the maids to actually come. Condo had a good view of snow, particularly the snow that kept piling up in the parking lot. It was a good place at a decent price (once it was split among two people). It also made abundantly clear to me that my house in Oklahoma is just way, way too big. This place in Frisco was a 2BR, three-story townhouse (the first floor was the one-car garage, the second floor was the kitchen and living room, and the third was the two bedrooms), and despite being out of breath every time I climbed a flight of stairs (Frisco elevation: 9,075), it seemed a more comfortable living arrangement than what I have in Norman. Man, but I will not miss this place. Frisco is a cool, if perhaps fake, town. Fake in the sense that it exists mostly as a place for tourists to rent condos. It was probably a real mining town once or something. They have a nice, fake main shopping area, though, where Garry and I got Cajun food that tasted good and sat bad. That — that was about the extent to which we interacted with Frisco, unless you count the trip to the Safeway and the outdoor goods store where Garry bought a pair of pants. Then Garry took off for home, and then I took off for home. My drive back was during the weekend of The Great South Plains Ice Storm of ’17. 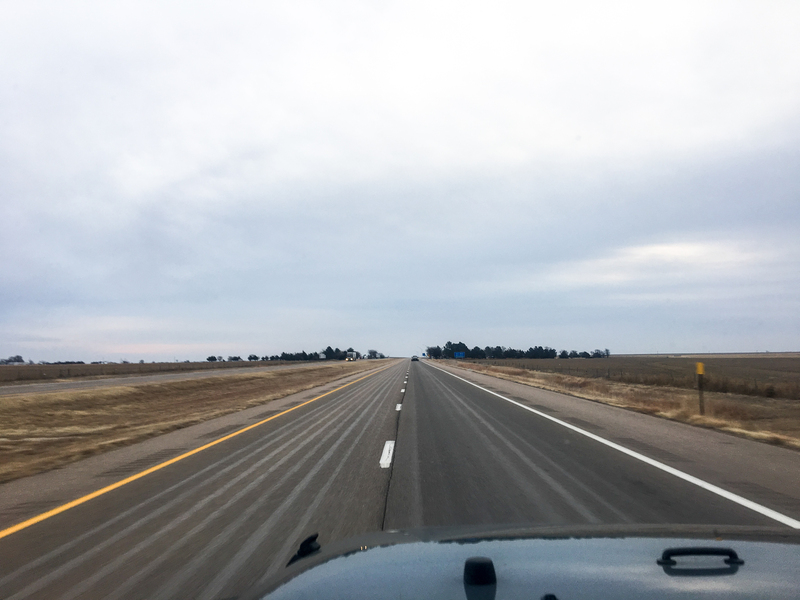 Kansas geared up for it by painting wet-look stripes all over I-70. 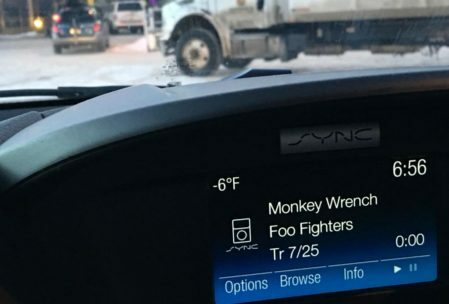 Of course, then, on that Saturday when everyone who ventured out doors was predicted to spontaneously implode due to contact with ground ice, the temperatures never really got below 35. It was kind of nice — given all the bitter prognostications from the weather-industrial complex, there was no one on the freeways and I was free to cruise largely unmolested. I hope for more such ice storms in the future and will doubt forever the integrity of weathermen. And that was my winter vacation. Now you know. Although it also spat snow somewhere in those mountains, a true harbinger of the two weeks to come. Which is good, since I cannot abide a false harbinger. 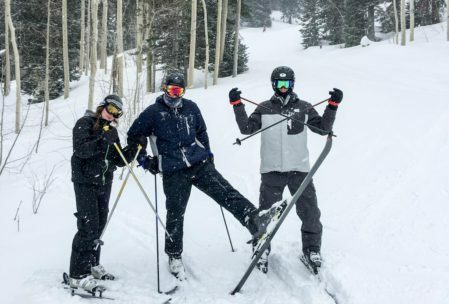 Wait, key point in here: part of this winter break was motivated by the fact that last April I bought a 2016-17 season pass for Copper Mountain, which comes with three free days skiing at certain places, including Taos and Monarch. 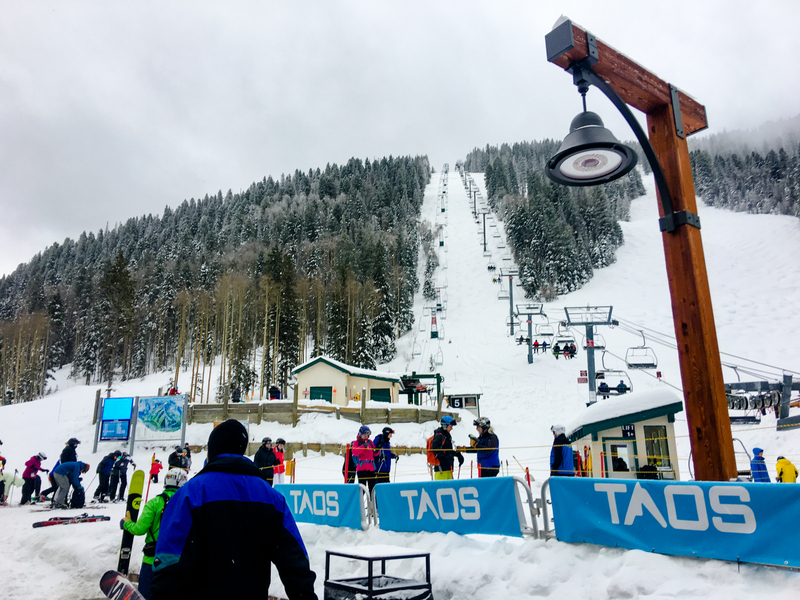 Right, so then on New Year’s Day I skied at Taos. Most of the state of Texas was still there (excepting Shamrock). It wasn’t skiing great, but it was a first ski day of the year. 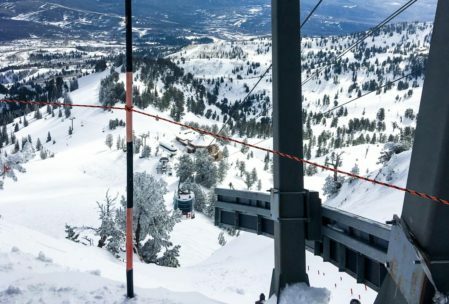 Alarmingly, it turned out that New Year’s Day was a blackout day for my reciprocal season pass, meaning I ended up having to pay money like a sucker. Also, even after you take the tram from the parking lot to the lifts, you still have to walk another 500 yards to get to the actual lifts. So hard. I didn’t go there to get exercise. 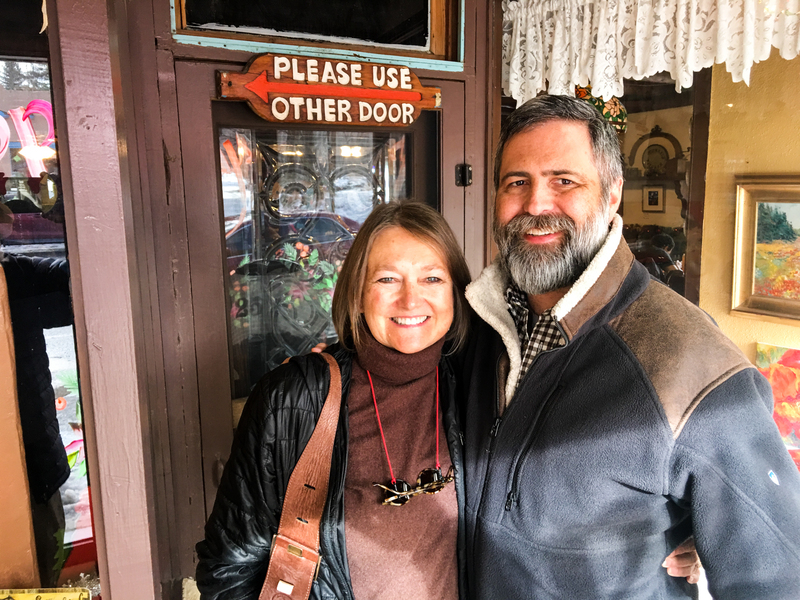 Anyway, I ended up calling my Aunt Debbie who lives in Taos and met up with her and Uncle Paul for dinner that night (as well as breakfast the next morning). It was good. Had some great New Mexican food at Guadalajara and more New Mexican breakfast at Michael’s. I’m not sure why I’m choosing this point to start shouting out restaurants in my blog, but here we are. I met Michael while we were at Michael’s, as well as his wife who insisted that I looked a lot like her nephew, particularly due to the beard. I don’t get that very often, so I enjoyed the novelty. ^^ My Aunt Debbie and I. I’m on the right. Debbie also helpfully instructed me on the right way to pronounce the name of the town I was heading to next, Salida, pronounced Sa-LY-da as if the Spanish language weren’t actually a thing. It turns out it was named after the Spanish word salida, meaning exit. Coloradans! Well anyway, drove from Taos up to Salida. I’ve driven that road at least a couple times before, but only in summer. It’s way cooler/prettier with some snow on it. And then I rolled into Salida. I stayed at the… I dunno. Salida-Monarch Inn? Something like that. It was a good value motel that appeared to be owned by someone with a pretty grand vision for interior decoration (relative to value motels). Just saying that it was way more stylish than any budget motel I’ve ever stayed at. Recommended. 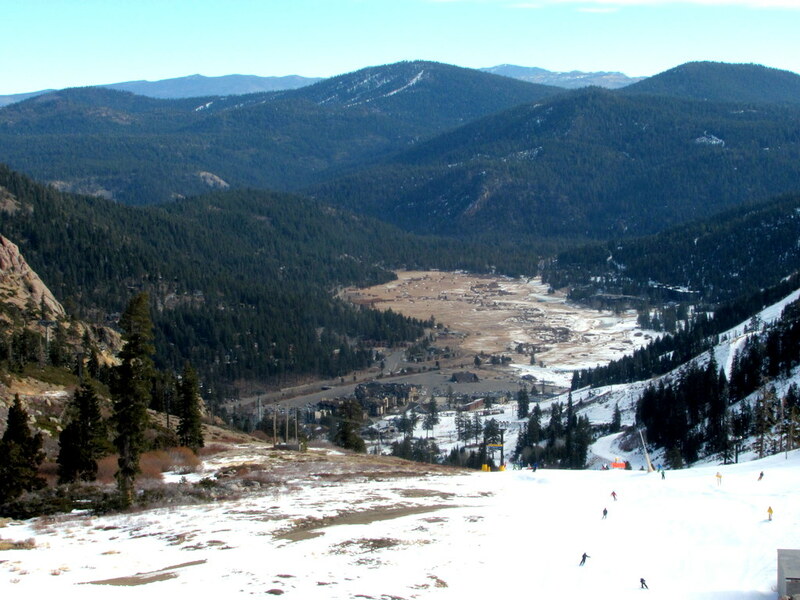 Skied a day at Monarch. Monarch’s a little ways from Colorado’s population, so it has a nice, under-visited vibe going on at it. All the lifts are old-school slow lifts (all but one’s a two-seater IIRC), but that suited me pretty well. 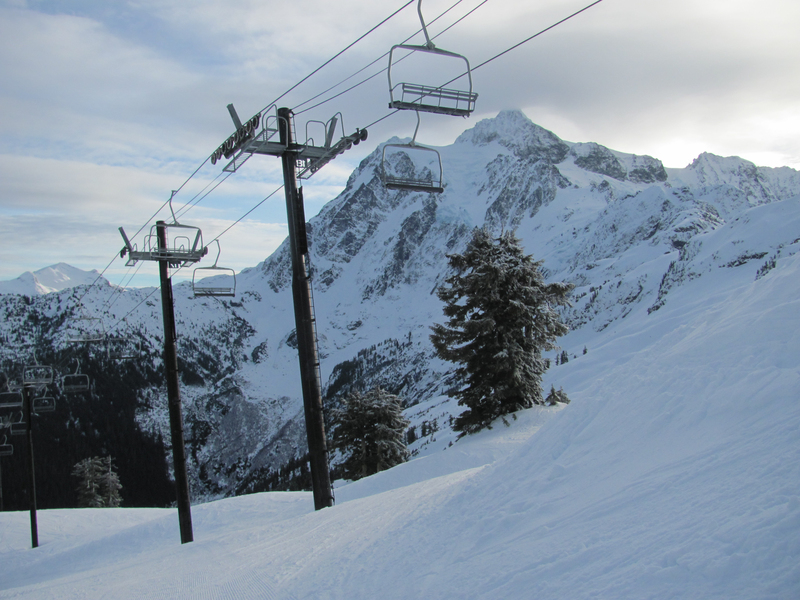 Yeah, so it’s the time of year where I just keep putting up lazy ski vacation blog posts. It snowed a few inches the night before, so the hill was very good. Some flat light, but plenty of trees to break it up. The cafeteria had three things on the menu: hamburger, hot dog, pizza. The pizza was remarkable though. On the way out, I stopped by the gift store to get my trophy mug and asked the worker there that, of Wednesday or Thursday, which should I ski? (Because I needed to work one of those two days.) She helpfully got on her computer, checked the Internet, and suggested that Thursday should be pretty (her word) “epic”. So I went home, ate a pb&j, and then sat around the hotel all day Wednesday working on an upcoming data collection. It was sort of like a harbinger. Anyway, I therefore got to spend a bonus day hanging out at the hotel and in Salida. (I wasn’t the only one.) 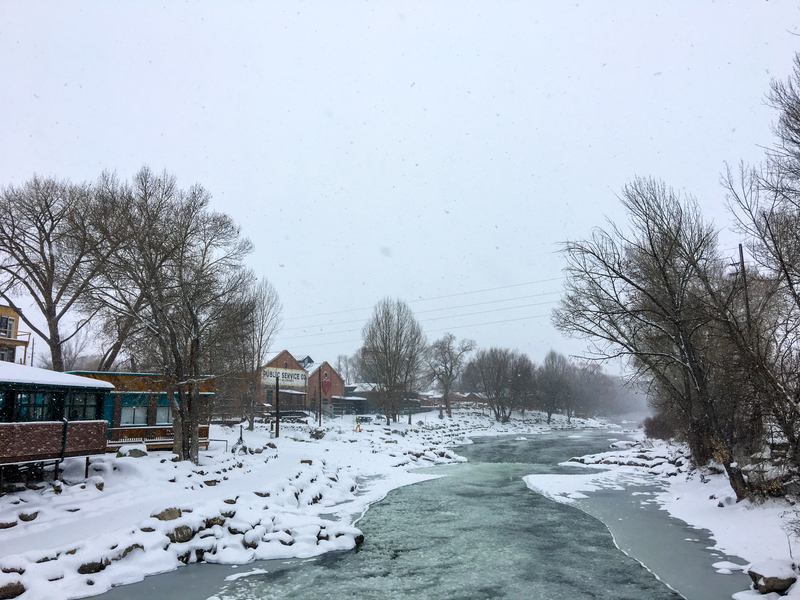 Pronunciation aside, Salida was a cool little town with enough real people living there to help balance out the hipsters and their cupcake shops. Those are real ice chunks in the river btw. Also btw, Salida is at about 7,100′ in elevation. 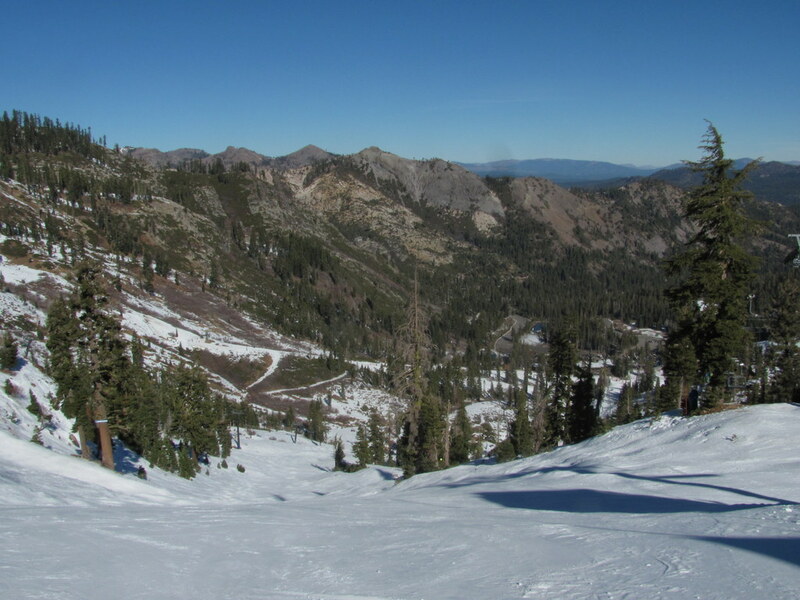 Monarch Mountain (the ski resort) has its base at 10,780′. These are high places. Things opened up again on Friday, so even though I was supposed to be in Frisco by Friday night, I thought I should check out Monarch again. I felt pretty bonded to the place for only ever having been there once. This is what the drive looked like at the lower elevations. I’ve been living in Oklahoma, which is a flat place and one where compact snow and ice doesn’t happen. Anyway, 45 minutes both directions, but the resort was having a pretty good day. I should also just mention: as inconvenient as it was to miss out on one of my planned days of skiing, as a tourist-skier, I never get this lucky. New snow? Unheard of. 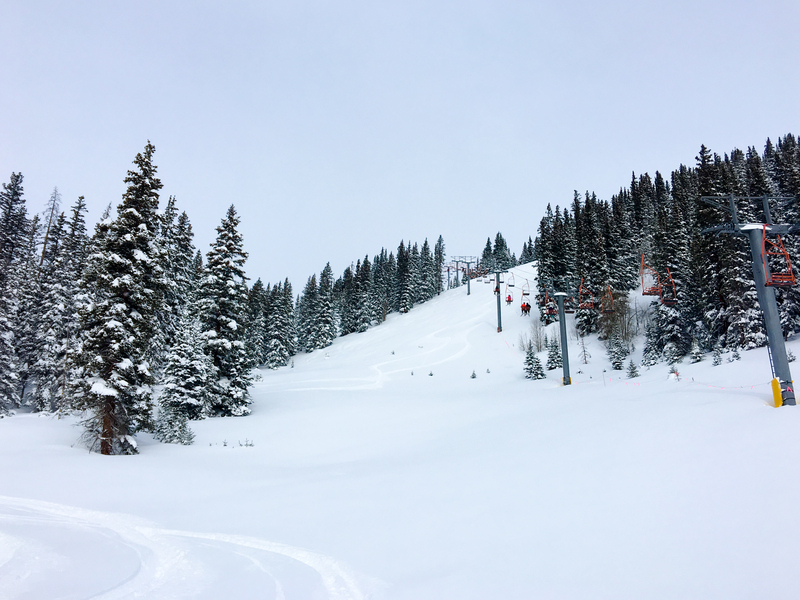 Ten inches of untouched powder? Never seen it before. It was pretty amazing. And then I left, because I was supposed to be skiing again the next day at Copper and, anyway, the roads were supposed to be dodgy. Went to Monarch for the first time yesterday. That place is awful. No one should ever go there. First off, Monarch is far from everything. It’s not even in the middle, but rather on the outskirts of nowhere. The town of Salida (pronounced Sa-LY-da as if the Spanish language isn’t even a thing) is the nearby “city”. No real hotel chains in the entire place. How am I supposed to use my Hilton Rewards points? Monarch itself is super-high in elevation. The base is at 10,790’. Hello, altitude sickness! 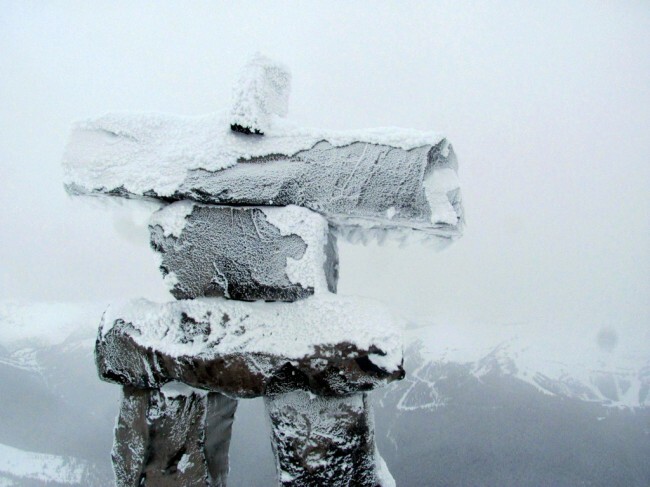 Since it’s so high, it’s (a) super-cold and (b) super-windy. I heard a couple of locals at the ski rack and the one said “it’s windy this morning” and the other said “it’s always windy at Monarch”. So why do you keep going there?! The highway up to the mountain is steep and there are hardly even any cars on it! Not sure why they built all those passing lanes. The total vertical is only 1,200 feet. If you care at all about vertical, you’d be better off going to Wisp. All the lifts here are old and slow. If you ever wanted to know how awful skiing in the 70’s must have been, you should come here. 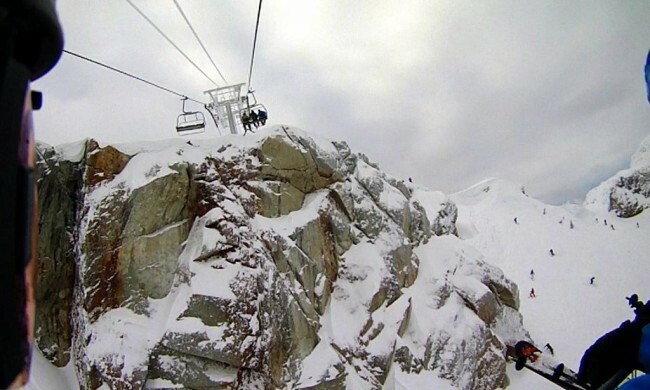 There are two lifts that cross each other mid-stream, which as everyone knows is considered bad luck in alpine countries like Austria and Switzerland. No gondolas or anything heated! You just have to sit there shivering all the way up the hill. They only have like five lifts (if you can really call something that only goes up 1,000 vertical feet a “lift”), and most of them are painted black, which is really boring. 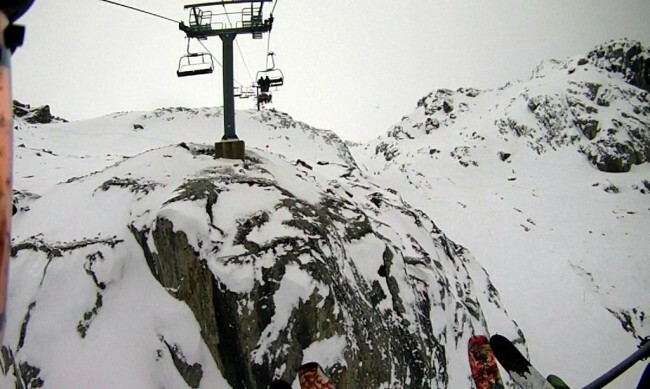 Since they have so few lifts, they try to make up for it by having way too many runs off of each lift. Clearly, no one there has ever heard of “paradox of choice”. The cognitive load I encountered every time I got off a chair was paralyzing. Not fun. In fact, there were times when I got stuck being on trails all by myself. 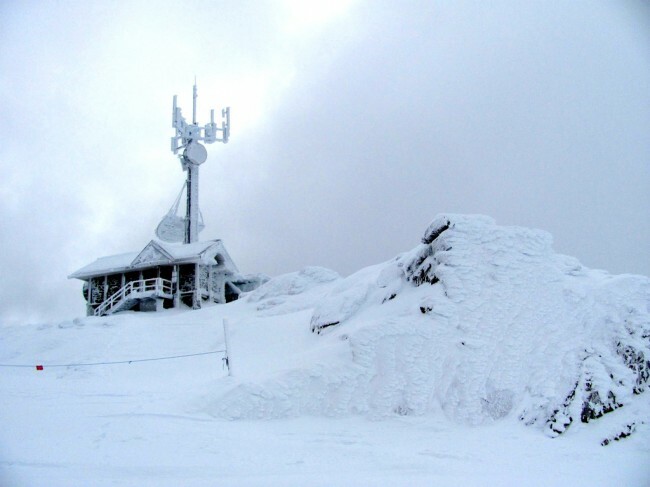 Monarch brags about how they don’t do any snow-making, which, I mean, how is that a good thing? 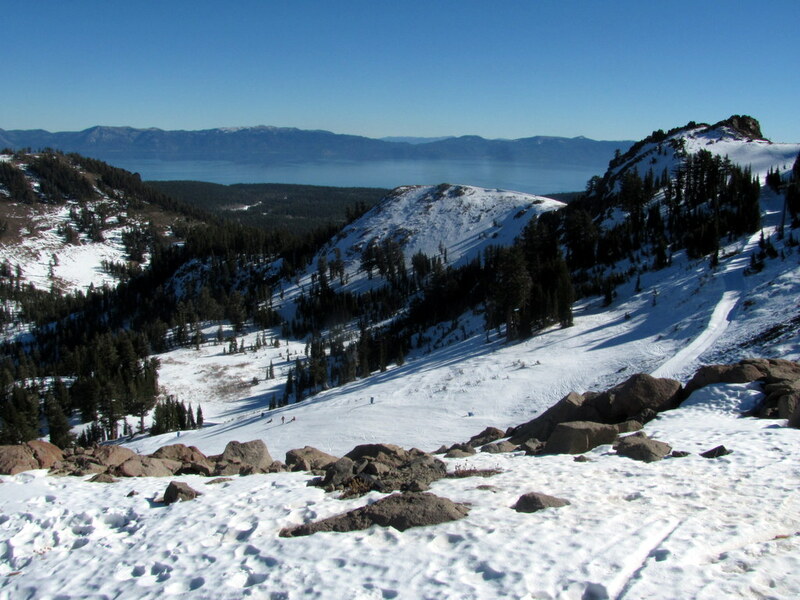 All the truly great resorts make snow. Not surprisingly, I saw a non-zero number of exposed rocks as well as some twigs sticking out from the snow. What’s with all the trees? I want wide-open runs everywhere that I can traverse all the way across before turning around and slowly traversing back. 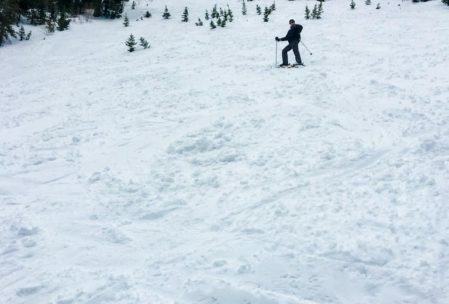 Monarch brags about having powder, but it wasn’t even knee-deep. Sometimes when I’d make turns the snow would spray *up* to my knees, but I don’t consider that “knee deep”. They say that all the lifts meet at the bottom, but that’s not true. There’s one entire lift that doesn’t reach the bottom at all. 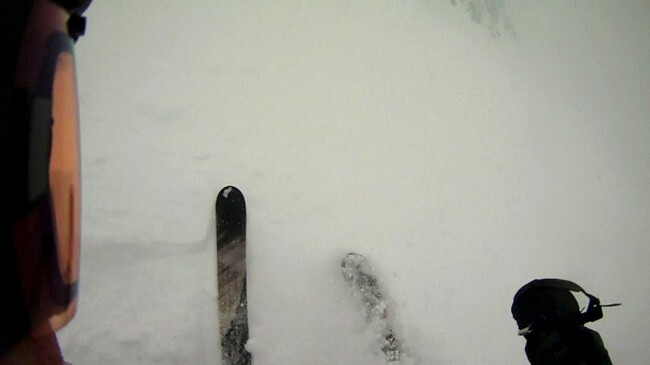 There are flat places on the slopes and sometimes you have to point your skis downhill in order to ride through ’em. They barely do any grooming and the runs they *did* groom got covered over with snow during the day, so they may as well have not even bothered. There are no specialty or gourmet dining options. I could not find Asian fusion cuisine or a heaping plate of quinoa anywhere. Instead, they have a cafeteria whose menu seems to have been designed by whoever runs the snack shack at the local Little League complex. Seriously, here are your choices of mains: hamburger, hot dog, pizza. Would it have killed them to serve the hot dog on a focaccia bun? There’s really nothing to do at the base: no antique stores, no art galleries, no semi-ironic waffle stands. Nothing to do at this place but ski. They don’t even have time share condos at the base (although I can’t imagine anyone would want one). Even resorts in less highly-regarded skiing states like Pennsylvania know it’s good form to include a bowling alley at the resort. Parking was free, which I guess is good, but there’s no tram system to take you from the parking lot to the base. You have to use your legs like a sucker. Someone needs to tell the lifties here that if I want someone to tell me to “have fun”, I’ll *ask* them to tell me to have fun. Every time I got off the lift, the attendant would wave. KEEP YOUR HEAD DOWN AND DO YOUR JOB. Seriously. Sometimes, the lift attendants didn’t even scan my ticket. Things could have really gotten out of control. Hard to get a really good read on what the locals are like since I only ended up sharing two chairs all day. Although in the cafeteria, there was a grandpa there with two kids who was so “laid back” that I was the one left to help the six year old put pizza on his plate. Sure, grandpa, it’s for the “glaucoma”; I believe you. 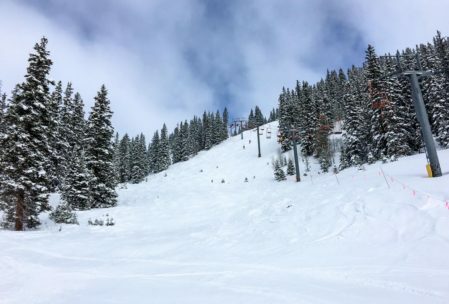 When I asked the clerk at the retail store what she thought the skiing would be like on Thursday, she said, “hold on, let me look it up” and then proceeded to get on her computer terminal and look up the weather report. No, no, no! At a first-class resort, the right way for a clerk to respond is “I dunno, you should check the website”. Basically all you need to know is this: despite it being a “decent snow day” during a holiday-ish period, the parking lot was barely even half full. No one wants to be here and with good reason! And the worst part is that I’m basically stuck here until Saturday. It seems like a long time ago. I was there longer than usual due to airfare insanity. Skiing primarily. A lot of family things. 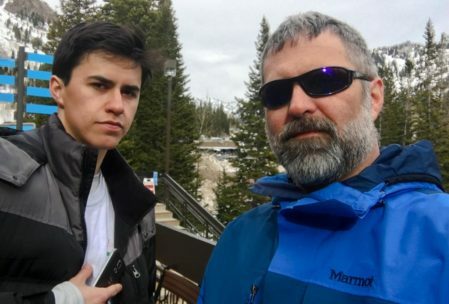 Thanks to Caitlin and Mark for letting me stay with them and RKD for driving up, I think, mostly just so I could spend a day or two with Ammon. Here are a bunch of photos. They’re in chronological order. At Snowbird with Jacob on his bday. 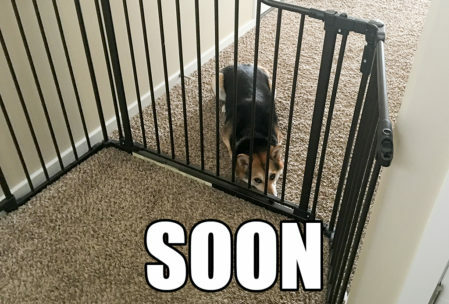 One of Mark’s brother’s dogs. Three of my brother’s kids. 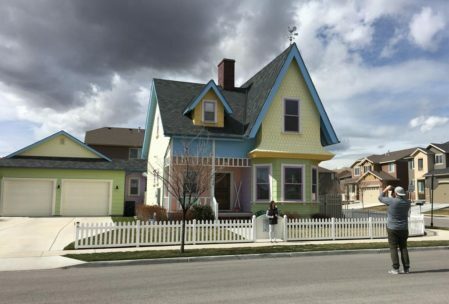 Where the movie Up was filmed. So depressing. 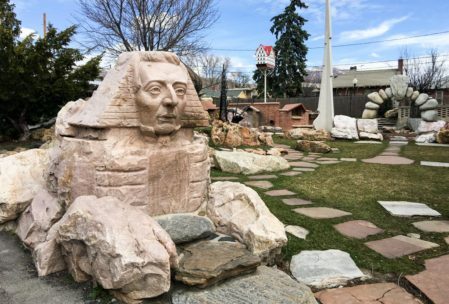 The Joseph Smith Sphinx at Gilgal Garden in SLC. 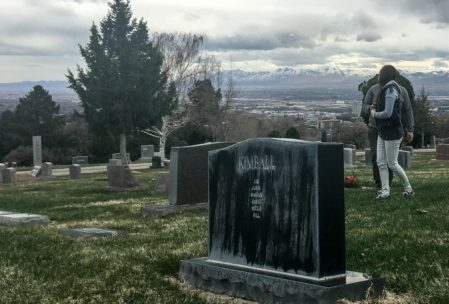 My grandparents’ gravesite; it took about two hours to find it. 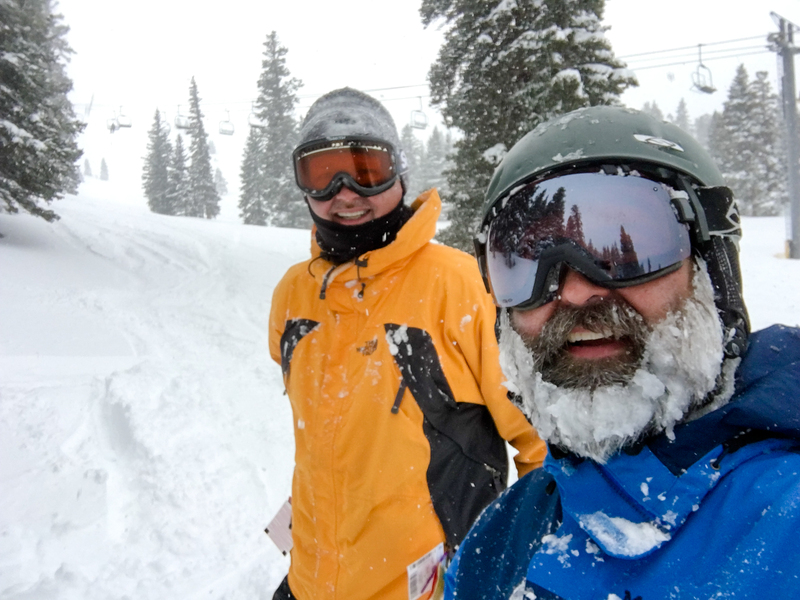 A good snow afternoon at Solitude; skiing socially. Right after they opened Honeycomb Canyon after it was closed for two snow days. Well on its way to tracked-out. 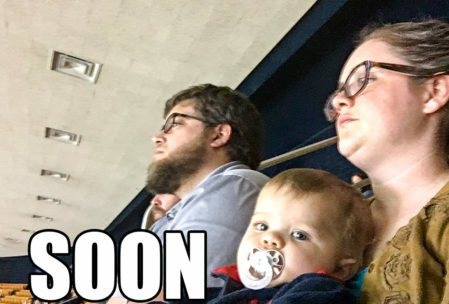 At a BYU NIT game. 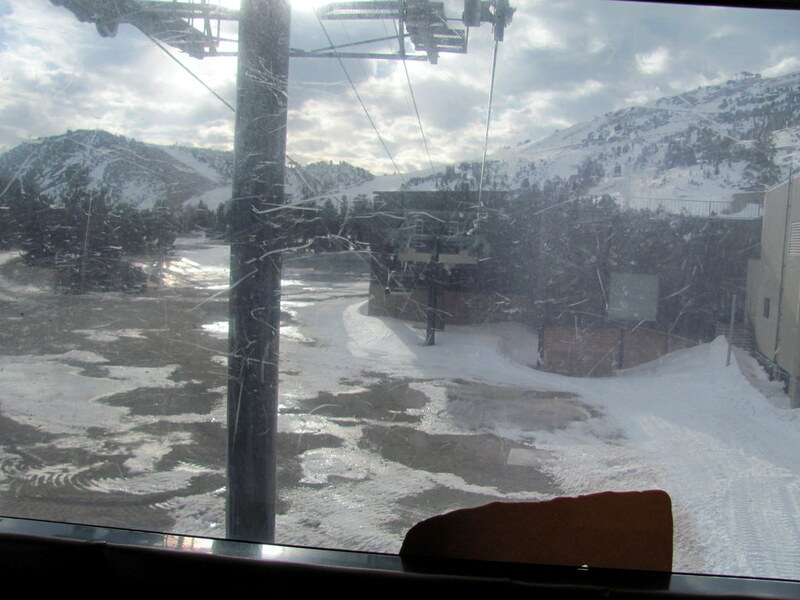 Top of the downhill course start tram at Snowbasin. Eh, good enough. Also went to an RSL game and a BYU baseball game. The wrong teams won both. 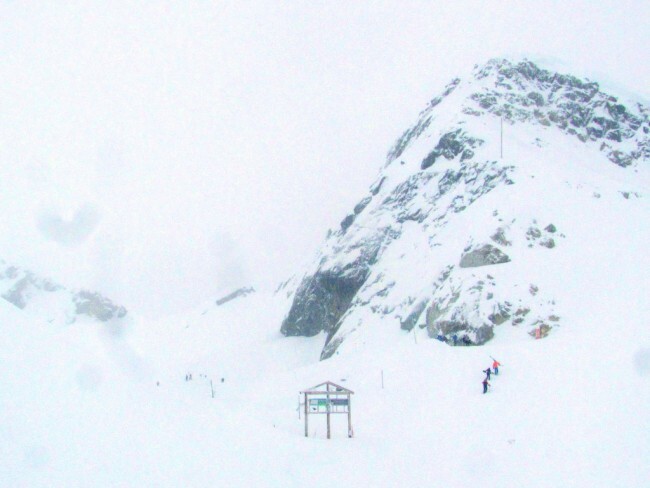 There are probably a couple ski days that are going un-pictured above. 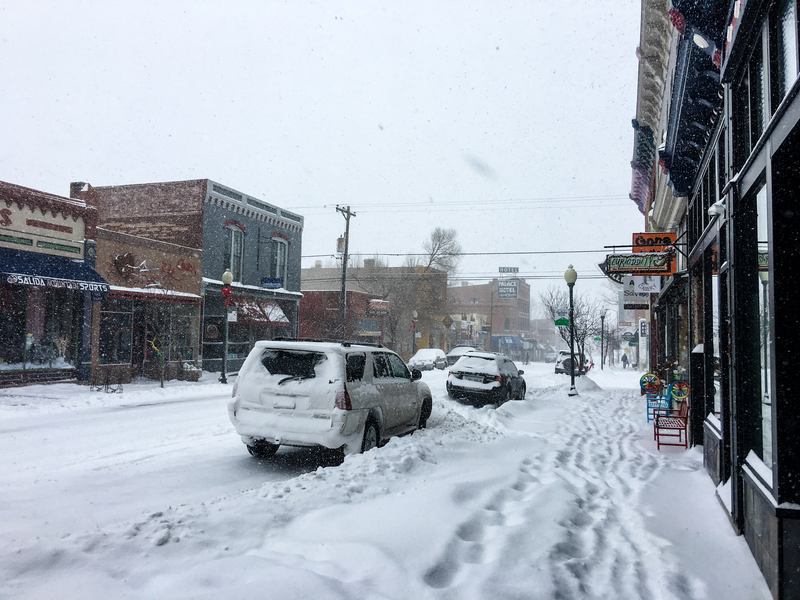 Went to Colorado for a quick (three-day) weekend back in February as sort of a proof of concept. 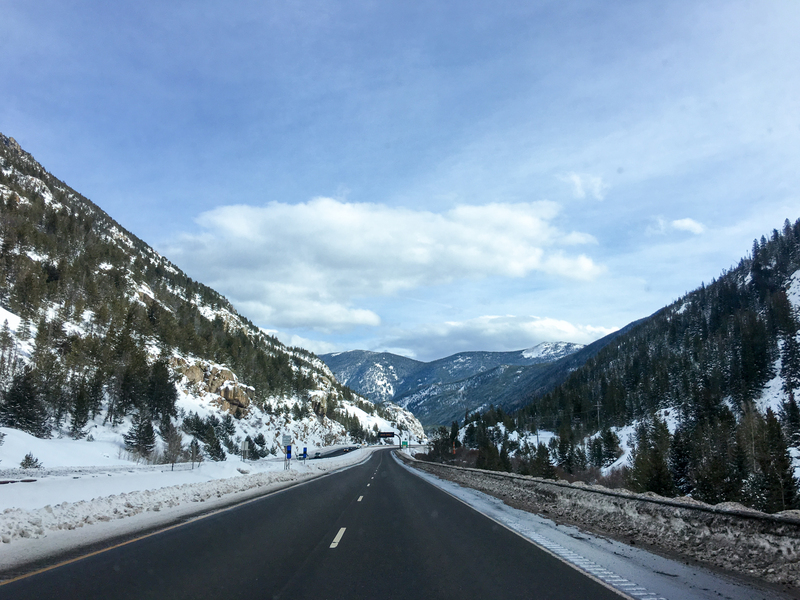 The concept being the reasonableness of going to Colorado to ski for a weekend. 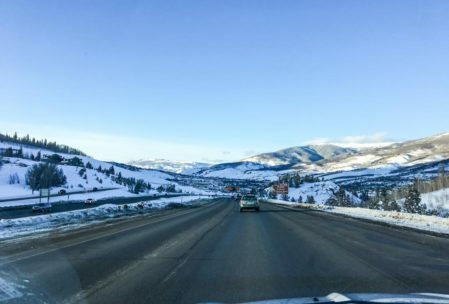 I flew in on Thursday night after class, rented a mid-size SUV (Ford Escape as it turned out) “at” the airport, then headed west on I-70, stopping at a pretty awful Super 8 ($89/night!) in a windy, very cold town whose name I’ve forgotten (and now looked up: Georgetown). 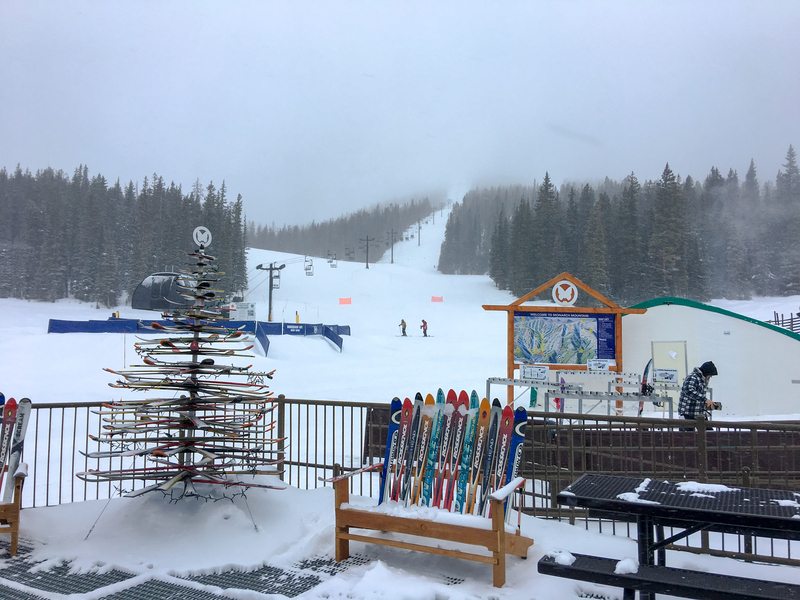 Skied on Friday at Copper Mountain, then Saturday at Keystone. On Sunday, I had lift tickets already bought for Loveland, but I was wiped out and it was still cold and windy at that hotel (the mountains were way nicer), so I just slept in, then drove to Denver and walked around Cherry Creek for a few hours before heading to the airport for a 5:00 (or so) flight. I bought a base layer in Cherry Creek at the Marmot store across the street (ish) from the mall. 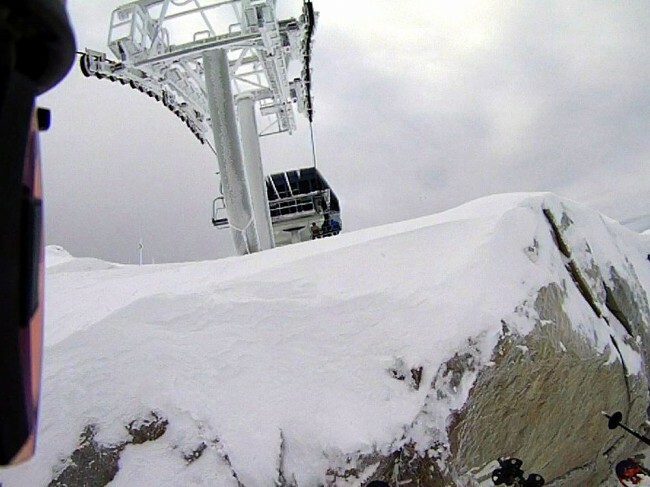 The old-school Blackjack lift on the back side of Copper Mountain. Some run at Copper, looking down on I-70 below. 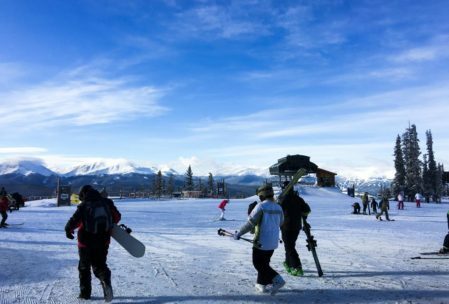 Keystone on Saturday started out cold, then got crowded. 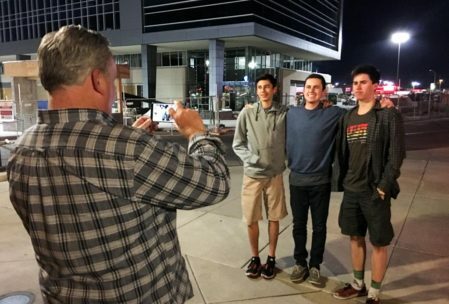 The crowds were mostly (based on a non-zero amount of data) with University of Denver frat boys and sorority girls. Which compromised the day, particularly after about 11:30 in the morning. It has an interesting layout — it’s a series of successive peaks, so that once you get off the first peak, you’ll never see the base area again. The best skiing seemed to be on the furthest peak back, where there’s a hike-to bowl (not much of a hike) and some interesting, officially recognized tree ski runs (tiring, but good fun and better snow than the rest of the mountain, which was a little scraped that day). Top of the first at Keystone. On a chairlift at Keystone was also, btw, the first time anyone actually asked me if I was 420 friendly. (“Oh yeah, I don’t care.”) Because he hurt his back in a dirt bike accident. The crowds got bad enough after lunch that it was hard to ski. 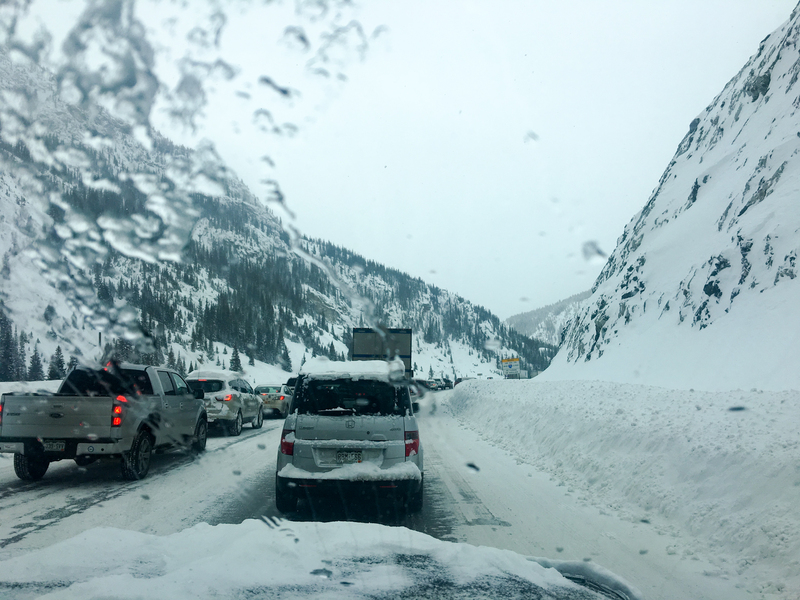 And on the drive back, I took Loveland Pass, which is a pretty harrowing snow-covered, insufficiently guardrailed route (and not actually any faster than staying on I-70 and coming via Silverthorne). I think this was on the way home from Copper. The Colorado ski weekend concept sort of worked. Might have been better to fly in on Friday, rest up and acclimatize to the elevation on Saturday, then go hard on Sunday and Monday, flying back Monday night. Staying in Georgetown was okay from the standpoint that it was a little easier to get to from Denver and only about 30 minutes from Copper, but the hotel itself seemed way overpriced for its level of badness (the carpets were worn down to nothing, the draft from the closed front door could be felt from the other side of the room). Next time, pay a little more and rent a condo in Frisco or Silverthorne for the weekend. The midsize SUV was probably the right rental car. Traffic was worse than you would expect for the middle of nowhere, but was not the 60 miles of bumper-to-bumper that the locals insist is typical on weekends. The Saturday crowd was bad and it wasn’t a holiday weekend or anything. It’s amazing how many huge ski resorts there are in that relatively compact area (Vail and Beaver Creek are just another 20 minutes west of Copper, Keystone and A-Basin are on that highway out of Silverthorne, Breckenridge is just east of Copper, Loveland is on the freeway and east of those areas, Winter Park is about, I dunno, 20-30 minutes north?). 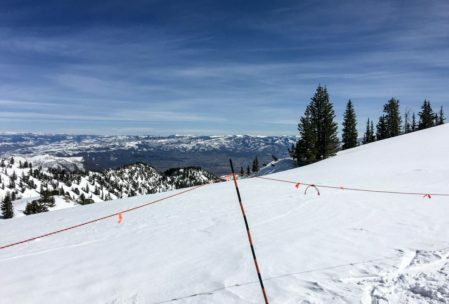 Also amazing that most of the skiers I talked to were local — in other words, those resorts get full to the gills with primarily locals as opposed to tourists. Denver airport itself isn’t bad as an origin/terminus, but the rental car lot that’s a 15-minute bus ride away and its location way to the east of Denver itself are inconvenient truths. In, apparently, 1987 there was this song that came out that, apparently, I heard more than once. The song was called “Christmas in the Northwest”. It was, well, you can check it out here: https://www.youtube.com/watch?v=e9Ze0FEuG4s. I was going to use the word cloying, but be your own judge. 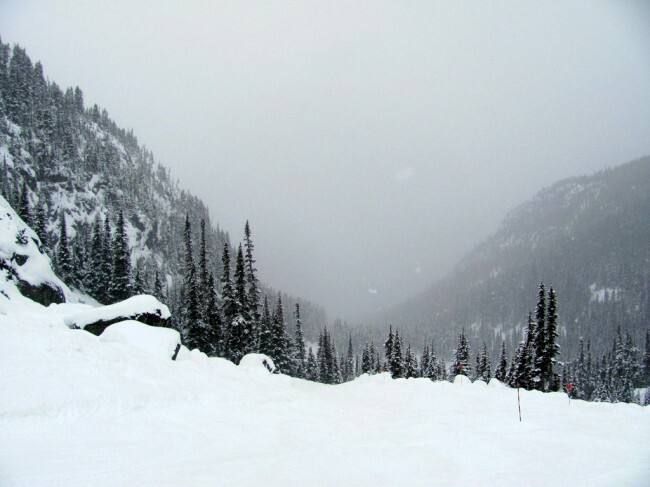 An upside of the song was the implication that somehow Christmas is superior when celebrated in the Pacific Northwest (or, as they call it in Canada, the Tropical Southwest). Also, any time I contemplate visiting my parents for the holidays, the song comes to mind. I usually go anyway. I guess I felt like I needed to post highlights of the most recent northwestern Christmas(-time activities). Ergo, this. 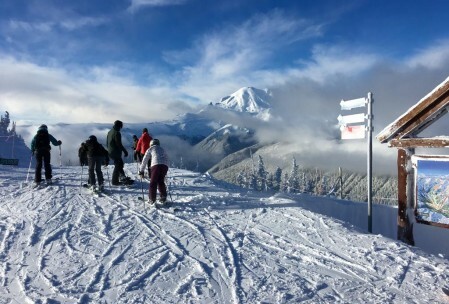 The first day I went skiing at Crystal Mountain (12/24). 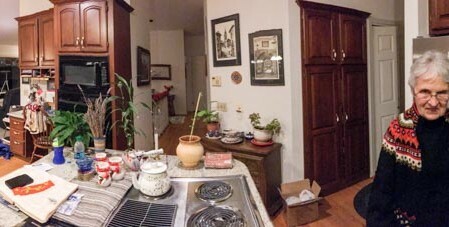 Panoramic view of my parents’ kitchen during the holidays (click through for the full panorama). 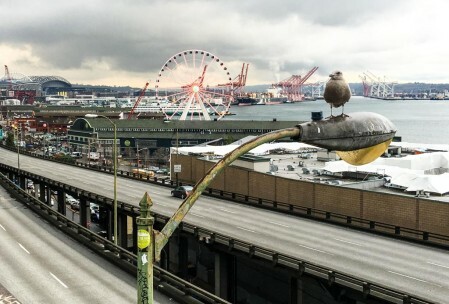 So there’s this guy up on the Seattle waterfront who, apparently, has been trapped in a glass cage. The tourists stare at him, but he pretends to not notice. 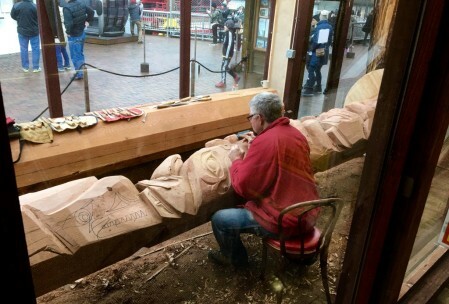 He is trying to make the best of it by spending his time hand-carving totem poles. At which point, I mean, good for him, right? My dad is a keeper of hummingbirds. This is one of the birds. The other time I went skiing at Crystal (12/30). 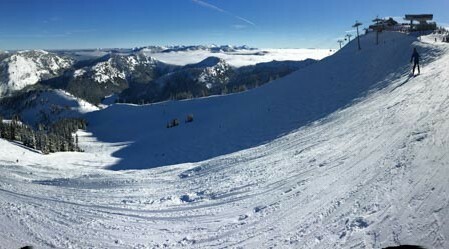 If you ever go skiing on Christmas Eve, it might seem pretty crowded in the morning, but it turns out that everyone is gone by 1 PM. They even had decent snow there. My mom and I spent a couple hours in Seattle, where we saw the totem pole, went to Ivars, priced out the ferris wheel ride, and then went to the Filson store near where the Kingdome used to be. 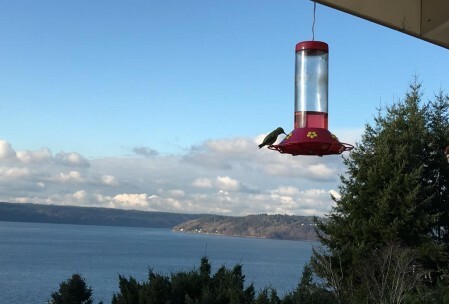 I have seen up to 20 hummingbirds at the feeders my parents have out on the deck. They go through a lot of sugar water. Plus half price for any additional days. 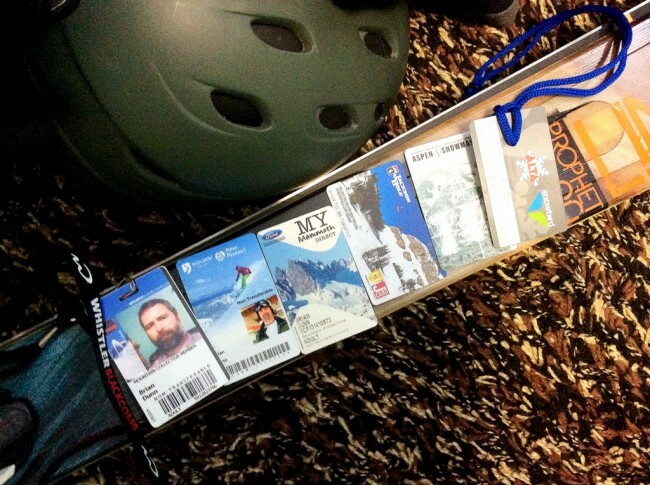 Of course, with a set-up like this, one feels naturally challenged to go to all six resorts. I therefore did that this winter (because, as this is my last as a grad student, I’m unlikely to have time/flexibility for it in future winters). I didn’t get in on the early-season sale at the $349 price point, so I ended up paying $379 for it. Considering that most (all? 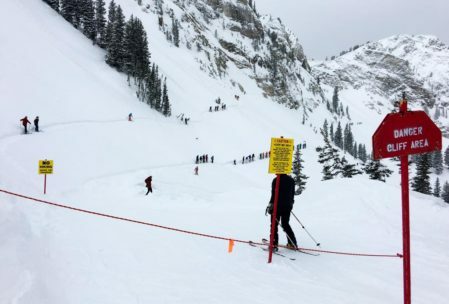 probably all if you insist on Alta-Snowbird being considered one ticket) of those resorts have walk-up ticket prices north of $100 a day, you can see the inherent value. 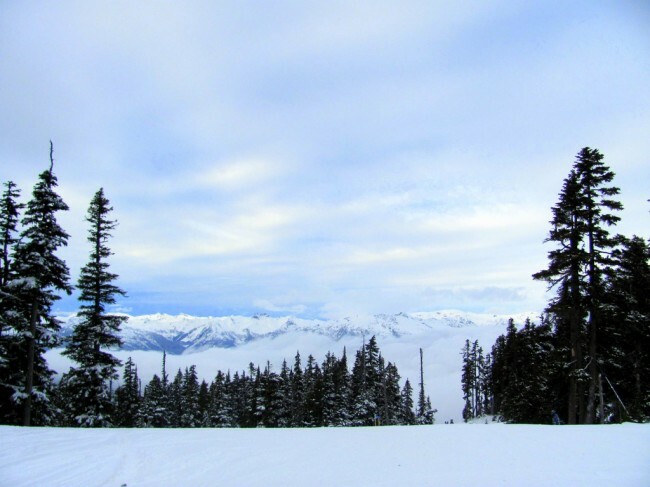 Two days each at six world-class resorts across western North America. Logistically speaking, this one came together all right. Switzerland: Fog and ice patches. PNW: Depending on the day, but fog and ice patches also. The terrain looks awesome; shame not to be able to ski it — it’s amazing that they’ve kept the place skiable at all I guess. The groomers were nice and satiny until 9:45 or so. 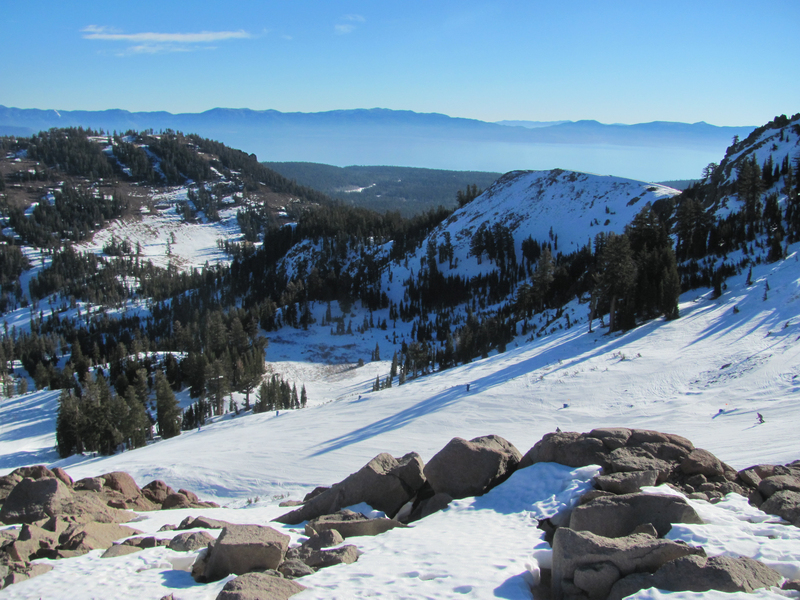 Unfortunately there was really only one skiable run from the top (Alpine Bowl). By 11, Werners (the second photo) had gone from too-firm to pleasantly chalky, which was nice. And by 12:30 most of the snow was way too soft. It started snowing on the 395 on the way back up to Reno — at least a trace fell on the road (!). Those playful tricksters at the CHiP decided to put out their Chains Required sign about 20 miles (I think?) 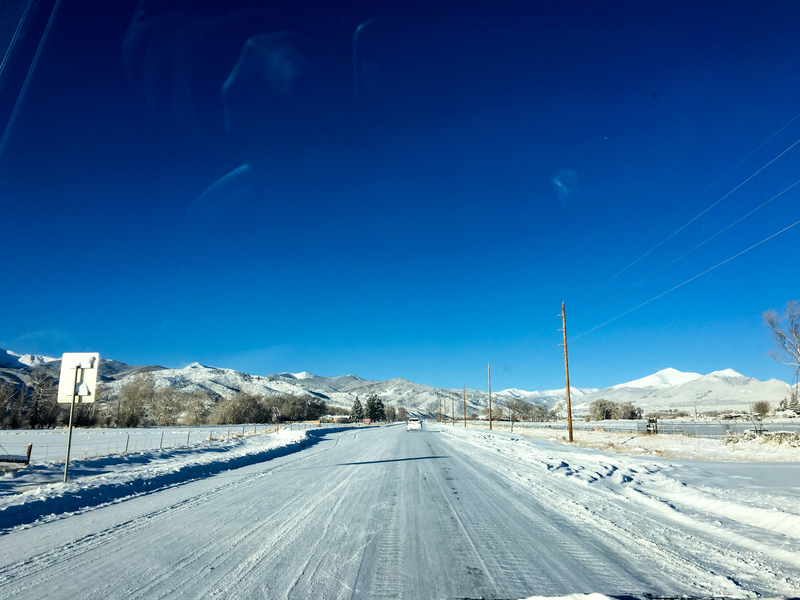 north of Lee Vining. I actually saw someone turning around and going back. Haha, punk’d!, etc. Beautiful light today. Should have brought my DSLR. Trees smelled great. Reminded me of that one part of Soarin’ Over California at Disney’s California Adventure (the part with the trees). I’ve ridden the Red Dog lift twice in my life now and both times it’s stopped with me dangling over the deepest part of the ravine. I don’t much care for that lift. 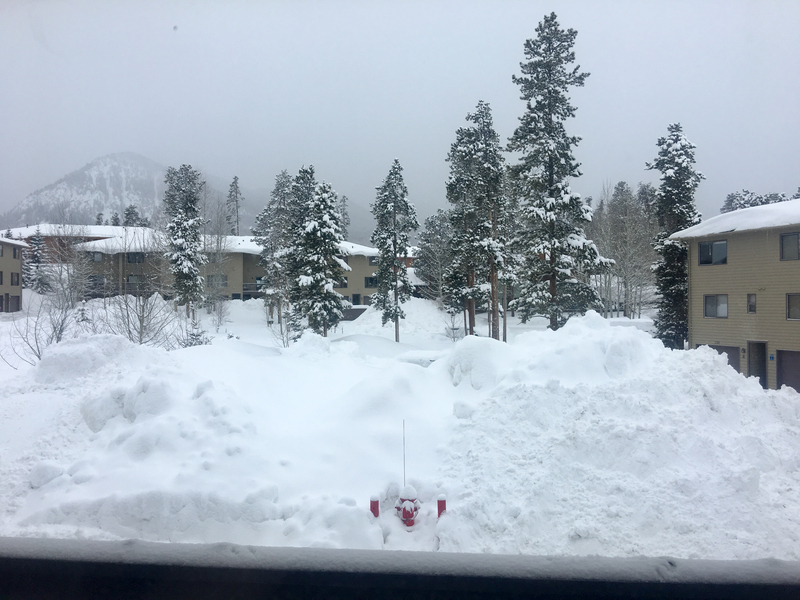 And now my Marginal Conditions Tour goes on hiatus until March when I’ll bring some combination of drought and fog with me to Utah and Jackson Hole. Maybe get some locust swarms and fiery rain too. 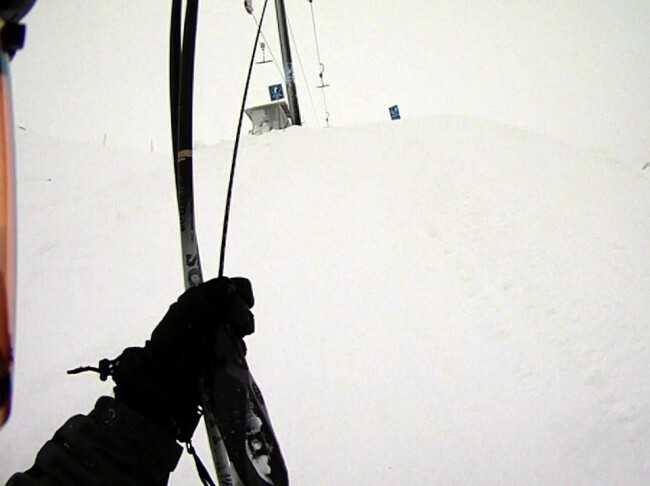 This blog is apparently now mostly about chronicling my experiences of skiing badly in as many places as possible. OTOH, at least it has a theme. I grew up in the Seattle area, but had never been to Mt. Baker before (for skiing). I’m going to go out on a limb and guess that what I saw yesterday was not Mt. Baker at the peak of its powers. Paid: $56.10 for some reason. Weather: Partly sunny very early, then high overcast most of the rest of the day. Would Return? : I mean, I wouldn’t go out of my way *not* to return. I went to Baker because it was the only place within three(-ish) hours of my annual holiday headquarters in Tacoma that was “fully open”. Although I think that of all ski resorts in the world, Baker is probably among those for which you can least easily gauge its openness by open trail percentages. Plus there were a couple trails that, once you were there, weren’t actually open. 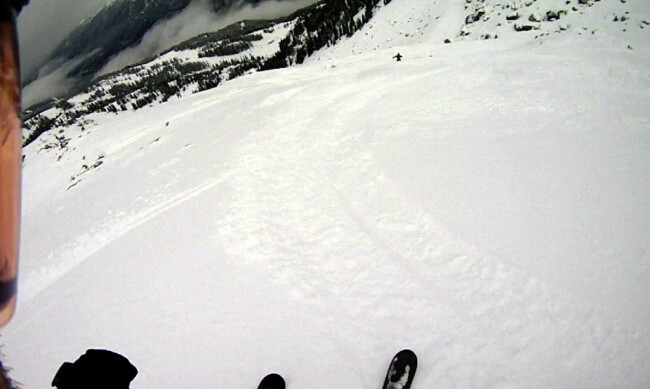 Snow was firm, eventually softening up on the intermediate slopes (Chair 8), but never on the steeper pitches (1 and 6). 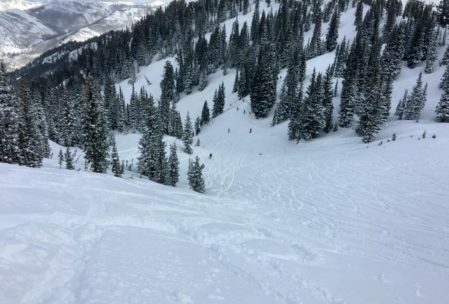 Fortunately, there were a lot of soft-enough bumps on the intermediates on Chair 8; unfortunately, there were also a lot of neophytes trying to snow plow down them. I was also surprised by the boarders here — it reminded me of the 1990s, but not in a good way. Every off-load, I was having to take evasive action to avoid the snowboarder pile. In numerous places it seemed like a flash mob of boarders had decided to reenact The Day After the Battle of Gettysburg. 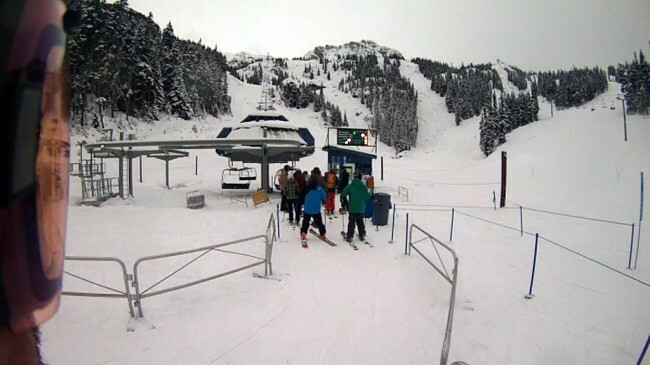 I know this was during the kids’ winter vacations, but it was much worse than skiing on 12/28 at White Pass last year. 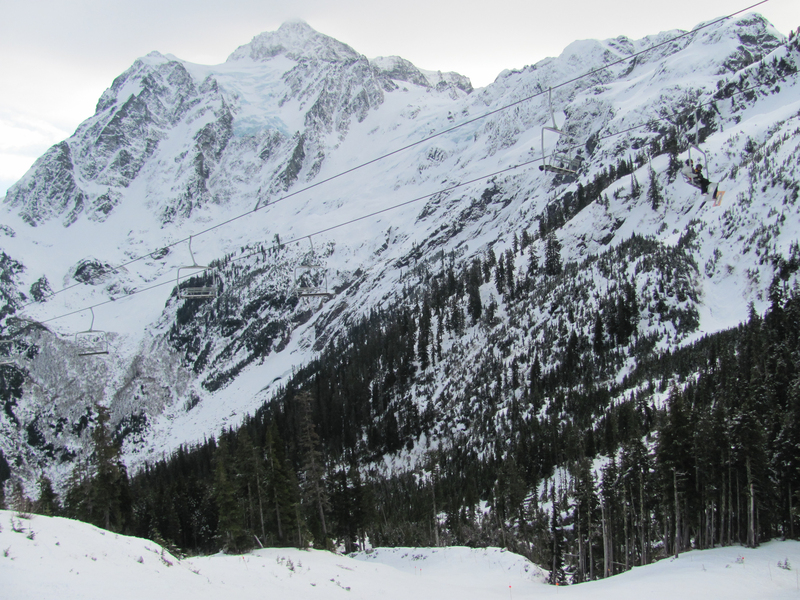 Given that there were no lift lines and there were plenty of open parking spaces, the skiing felt oddly crowded. That said, the views were great (see below) and, IMHO, the views alone make Baker worth visiting (one time anyway). The lifties were exemplary (except in getting people to clear away from the offload area). 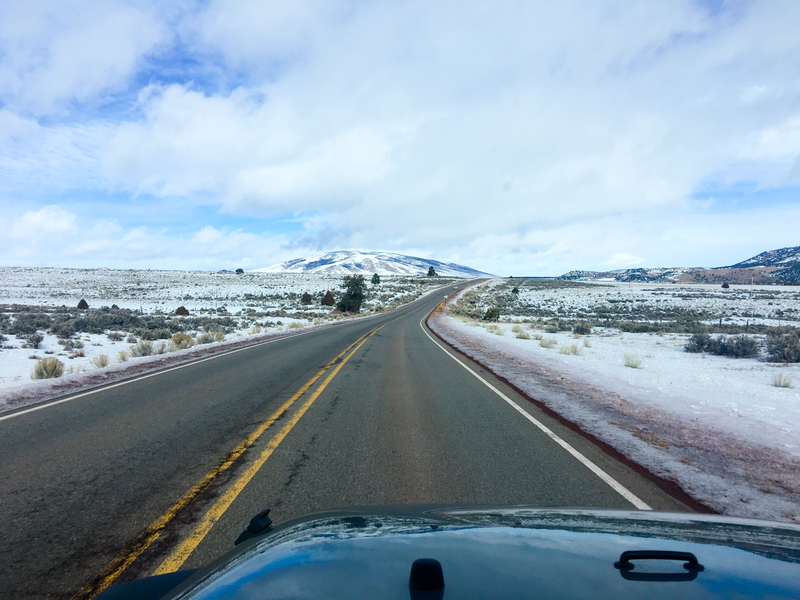 Despite the paucity of snow throughout the west, the hazards here were minimal and easily avoided. Weather and visibility were both very good. 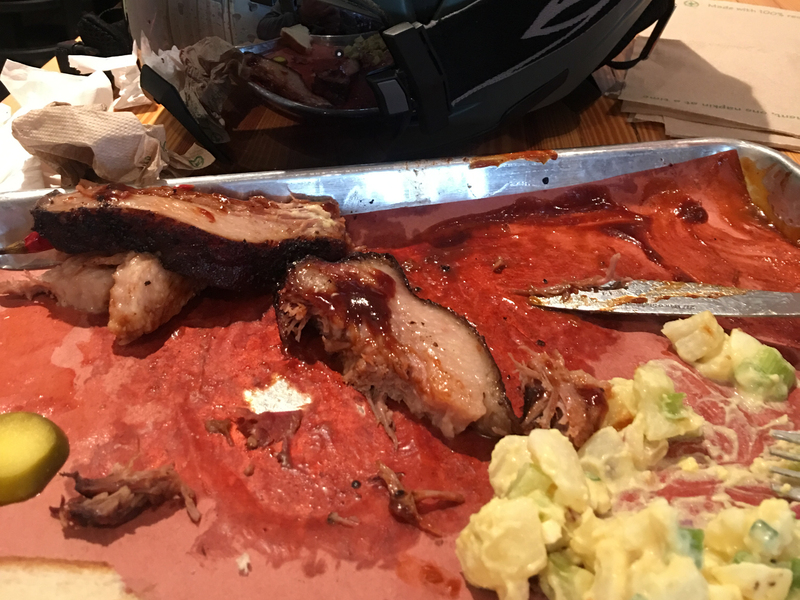 Lodge food was neither extraordinary nor expensive — a tradeoff I was more than happy with. Parking-to-lift was among the best ever (parked at White Salmon, second row, very easy access to the ticket booth and then C-7). Had good on-lift conversations the few times chair sharing happened. It seems like I get my best perspectives on life, activity, and aging from 60+-year-old random lift strangers; good job, whatever your names are. 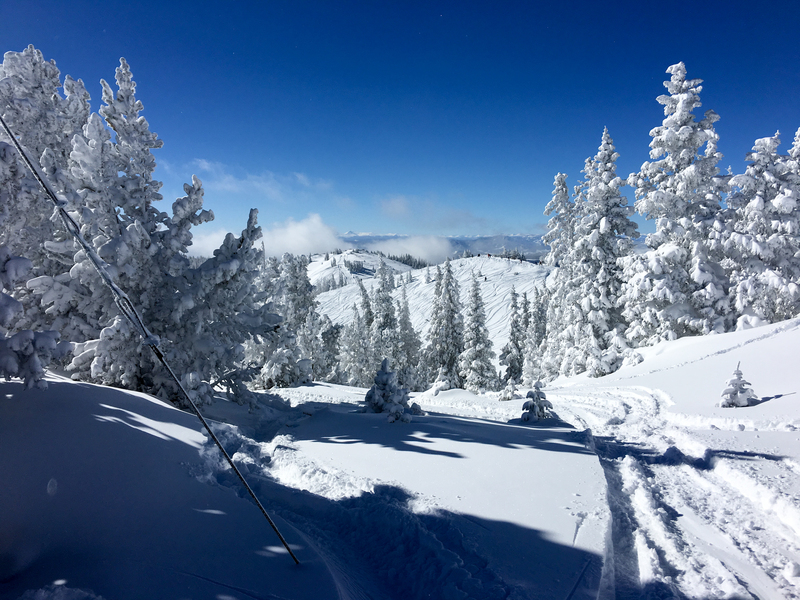 If I ever were to get into back-country skiing or had someone willing to show me the ropes at Baker, I’d probably need to go back. The out-of-bounds you can see from the chairs looks amazing. However, given the practicality of it being 3+ hours away and the occasional oddness of the on-piste offerings (I got the impression that the lift layout may have been designed by Pittsburgh-based city planners), with decent snow and weather conditions and given my skiing preferences it would be hard for me to justify Baker over the easier access to Crystal. 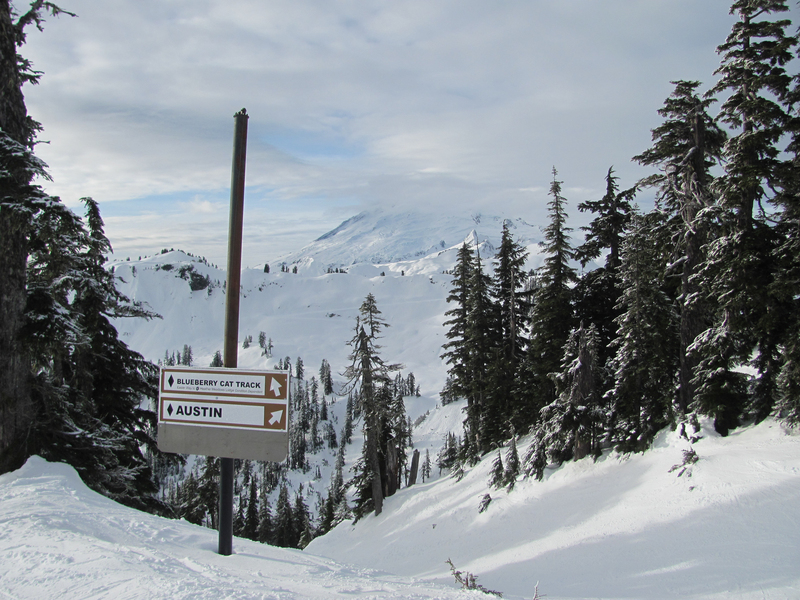 For the “laid-back and local” feeling, I think I preferred White Pass’s relative politeness and self-awareness (perhaps Yakima County does a better job of controlling its youth than does Whatcom). But, whatever, it was fun.